Manchester United face a challenging trip to Stamford Bridge to take on in-form Chelsea this Saturday, and may have to do so without a number of key players. 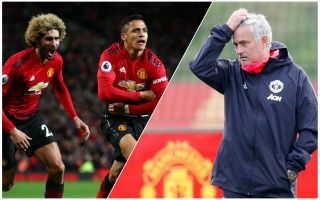 Jose Mourinho will have to try something a little different to make up for some potential absentees, while he could also generally do with shaking things up a bit after just one win in the club’s last five games in all competitions. ESPN claim Marouane Fellaini could be out after missing Belgium training with a groin injury, while Sky Sports also suggest Nemanja Matic is a doubt for the Chelsea game with a back problem. That report suggests Luke Shaw is also still working to regain his fitness after missing England duty with injury, so that could mean resorting to using Ashley Young at left-back again. Jesse Lingard, meanwhile, has hinted he could be set to return after posting an Instagram live video of himself hitting the gym and talking about ‘game week’. With that in mind, we’d suggest putting Lingard straight back into the team due to his good big-game record, having scored the winner against Chelsea last season. The England international has also scored at Stamford Bridge before and his inclusion in a front three could mean an opportunity to finally drop the misfiring Romelu Lukaku and try Alexis Sanchez at centre-forward. The Chile international has not looked at his best in wide positions since moving to Old Trafford, but scored a fine headed winner against Newcastle before the international break in that central striker position. Juan Mata should also start in midfield after an influential display against the Magpies. With those injuries to Matic and Fellaini in midfield, this is surely a good opportunity for Mourinho to use Ander Herrera in a defensive role. The Spaniard notably man-marked Eden Hazard out of the game when the two sides met towards the end of the 2016/17 campaign, and they’ll need a way to keep the in-form Belgian quiet now. It remains to be seen how this slightly experimental side will work in such a big game, but Mourinho arguably has few other options and little to lose at this point as he needs to show he can try something different to revive his team’s fortunes with what would be a statement victory.